Planning your healthcare simulation training center can be an immense undertaking. With so many important considerations involved (obtaining the funds, designing the space, procuring the equipment, training staff, etc.) one might ask: Is it really worth the trouble? Here are just a few useful tips to help make this important endeavor a successful one, from the beginning and throughout the many stages of designing a simulation center. A patient simulation program is a living testament to an institution's commitment to being on the cutting edge of healthcare training. Grants and foundation funding are usually the most viable routes. But, when the administration, senior faculty and/or the organization's governing body are brought onboard, they may willingly assist in the work needed to obtain funding. To get buy in from these key stakeholders, it will be necessary to detail the precise value that the simulation center will bring to the entire institution. The actual space dedicated for patient simulation must, of course, be sufficient for the mannequins, patient beds, monitors, electronic equipment, workstations, clinical supplies and other essential hardware. But when planning the space, it is also essential to factor in something as seemingly benign as the location of changing rooms and debriefing rooms, as well as space for storage and offices for technical and training staff. Planners must also provide for the possibility that the facility's priorities may shift over time. Flexibility, therefore, must be a part of any simulation planning strategy. It is essential to define the needs of the simulation center and choose the equipment accordingly. Whether the need is for a single room, multiple rooms serving multiple purposes, or for a simulation lab environment that calls for as much realism and suspension of disbelief as is possible, the kind of simulators and equipment selected will strongly determine subsequent, spatial and financial needs. When considering audiovisual equipment, or example, simulation center planners may need to choose a camera with higher zoom capabilities for detail work and cameras with wider angles for capturing team interaction from a different perspective. They may need additional network connections for monitors, computers, tethered and/or wireless mannequins and workstations. 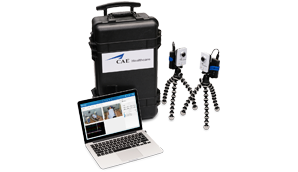 Contact a CAE Healthcare representative for information on how to plan your budget, manage your spatial requirements and obtain other essential details for a state-of-the-art healthcare simulation training center that will meet your learning objectives now, and into the future.